Robert Michael Ballantyne (1825-1894) joined the HBC as an apprentice clerk in 1841 at the age of 16. During his six years in the fur trade, he served at Upper Fort Garry, Norway House, York Factory, and Tadoussac. Although not a very good clerk, he loved the wilderness and wrote long descriptive letters home to his mother in Scotland. 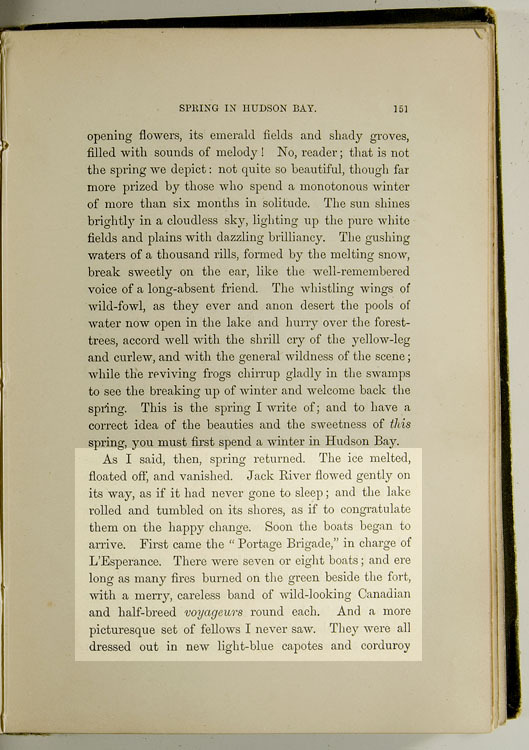 He began recording his experiences in book form in 1846, and in 1848 published Hudson's Bay, or, Every-day life in the wilds of North America. He later became a very popular writer of adventure novels for boys. “As I said, then, spring returned. The ice melted, floated off, and vanished. Jack River flowed gently on its way, as if it had never gone to sleep; and the lake rolled and tumbled on its shores, as if to congratulate them on the happy change. Soon the boats began to arrive. First came the “Portage Brigade,” in charge of L’Esperance. There were seven or eight boats; and ere long as many fires burned on the green beside the fort, with a merry, careless band of wild-looking Canadian and half-breed voyageurs round each. And a more picturesque set of fellows I never saw. They were all dressed out in new light-blue capotes and corduroy trousers, which they tied at the knee with beadwork garters. Moose-skin moccasins cased their feet, and their brawny, sun-burned necks were bare. A scarlet belt encircled the waist of each; and while some wore hats with gaudy feathers, others had their heads adorned with caps and bonnets, surrounded with gold and silver tinsel hat-cords. A few, however, despising coats, travelled in blue and white striped shirts, and trusted to their thickly-matted hair to guard them from the rain and sun. Read excerpts from Robert's writings - enter 'Ballantyne' in the search box to your left. What did Robert Ballantyne look like? Which HBC calendar painting includes Robert Ballantyne? Check the Beaver Index - e.g., type in voyageurs, Ballantyne, posts, clothing, etc. The life of a clerk was seldom as exciting as the life of a voyageur. Ballantyne began writing down his memories and experiences of the fur trade in 1846, to while away the long winter evenings at the isolated trading post of Sept-Iles, Quebec.